The Vertu Ti is a hand crafted luxury Android 4 smartphone with NFC that comes with a sapphire crystal screen and leather, alligator skin or red gold accents. 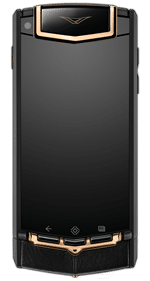 “Based around a titanium case that has been used for its strength, elegance and low weight, Vertu Ti also uses leather accents as well as the largest sapphire crystal screen ever engineered at 3.7 inches,” the company says. The Vertu Ti was announced in February 2013 and supports SIM-based NFC.